For family or for fun 5/5*. Our little Chevy blazer 4x4 SUV is the greatest family vehicle we have owned. We bought it pre-owned with only 120k miles and one previous owner. She not only gets 25 mpg on the highway but fits 2xlarge adults and two well sized teenagers comfortably for an all day ride in the truck! We have had to give her love but nothing major just your basic plugs and wires; brake pads and rotors in the almost 2 years we have owned her. I strongly recommend this SUV for family or for fun. She's a beast in a mud pit too. Love those electric bucket seats. The 2001 Chevrolet blazer with the 4. 3 liter v6 vortec engine with two doors is the most reliable dependable longest lasting small compact SUVs to have ever been on the market for the year 2001 it comes with two front bucket seats and a "oh crap" handle in front of the passenger seat with electric \drivers and passenger side seats. 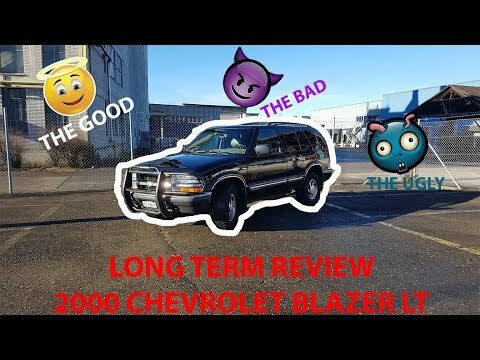 I highly recommend this vehicle to anyone just another great product made by a great car company Chevrolet!